The story of Noah and the ark is probably one of the most famous stories in the Bible. There are many children's books with great illustrations and interpretations of the covenant between Noah and God. When telling this biblical story, I love using pictures as a visual aid. It is an easy way to get the attention of all the visual learners in my class. Even when I use picture books as an aid, I find it much more meaningful to tell the story in my own words and personalizing it to fit my audience. 1. God created the world and he was happy. He looked down to the world and saw that the people in the world were not behaving nicely. Therefore, he decided to flood the earth. 2. "Noah was a righteous man, faultless in his generation." Because Noah was the only person in the world who was doing good deeds and being kind, God chose to save him, his family, as well as all the animals. 3. God asked Noah to build an ark. 4. The people in the world laughed at Noah and his three sons and did not believe that a flood would come. 5. Noah gathered all the animals two by two on to the ark. God flooded the earth for forty days and forty nights. Afterwards, God made a new world. 6. Noah, his family, and all the animals lived on the ark in harmony while they waited for the water to descend. 7. When Noah opened the ark's window, he saw water everywhere and not a single sign of land. He was unable to open the ark's door. 8. He sent the crow to see if it would find any greenery, but the crow came back with no luck. 9. He sent the dove, but the dove too came back with no luck. He waited for a while and he sent the dove again. This time the dove returned with an olive branch in her mouth (a sign of peace to this day). 10. 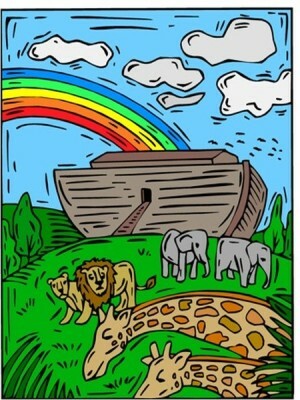 When Noah came out of the ark, God promised to never flood the world again, marking his promise with a rainbow in the sky. In return for his promise, God asked Noah to take care of the world. Add extra excitement to story time! Noah's Ark is such a popular biblical story that you can find lots of games and toys that can help enhance the children's learning. How do we know that God is keeping his promise? Children love to share their rainbow sighting experiences. Connect these experiences to God's promise to Noah and remind them that every time we see a rainbow we know that God is keeping his promise. How can we help keep the promise Noah made to God? In what ways can we protect the world, nature, and the animals? In what ways can we be kinder to one another? These questions are a great way to empower children and instill in them the belief that they can make a difference. Diversity in the story of Noah and the ark - We are told that the animals on the ark did not live in cages. How did all the animals manage to live together? In two words - Tolerance and Acceptance! This story teaches us that there is always room for everyone and that even though we are all different (in one way or another) we can all get along. In class, I use this story to discuss diversity in our classroom, at home I use it as a way to teach my son multiculturalism, tolerance, and the beauty of diversity in the world.